Adoption.com, an American company that profits from adoptions, and adoption-advocacy groups have filed a petition requesting pres. 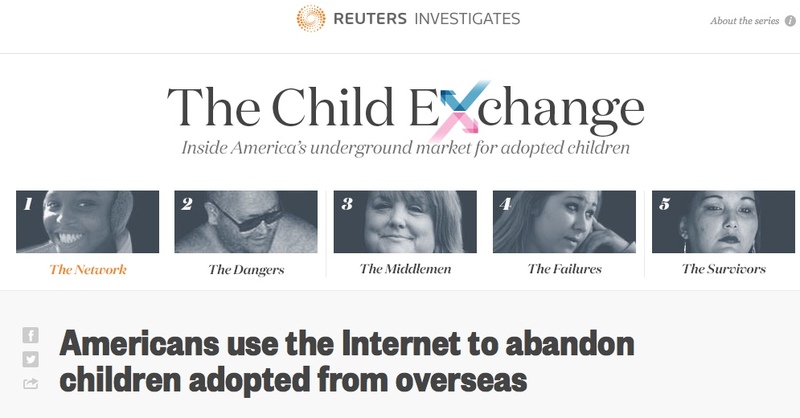 Donald Trump investigate the causes behind the decline in international adoptions. One of the biggest concerns of the company seems to be the continuous decline in international adoptions. The CEO of Adoption.com, which he founded 20 years ago, said if that trend continues international adoption could completely end within four years. The adoption profiteers say, “Every child needs a loving, permanent family, whether that child is in a foster home in the U.S. or in an orphanage in another country” and “Adoption prevents child trafficking.” The CEO of Adoption.com sees the number of international orphans as too large to ignore and cites statistics of orphans who commit suicide or a crime, become homeless and of the girls who age out of orphanages and are forced into prostitution. Orphanages recruit kids to get foreign donations. “The children are being commodified and placed in orphanages for the sole purpose of bringing in donations and other donated goods. The children have families, they’re exploiting vulnerable children, vulnerable people, vulnerable guardians.” Click on the image above to view CNN video. Networks of traffickers are suspected of recruiting and deceiving children into orphanages to gain money from abroad, the Haitian state research authority believes. Indeed, Lumos found evidence of parents believing their children would receive a better education in orphanages, orphanage directors paid “child finders” to recruit children to the orphanages, and in some cases families were paid $75 to give their child away. “Many parents are deceived into giving up their children, purely so that unscrupulous individuals can make a profit,” said Lumos’ CEO. Click on the image above to read more. Lumos is an organization that rescues children from orphanages and reunite them with their families. Lumos is an organization that rescue children from orphanages and reunite them with their families. They change education, health and social care systems so they can all be protected and protected. Other people and organizations help vulnerable children escape poverty and be cared for within their families or communities. Tara Winkler is one of them. In her conference at TED (click on the image below to watch the video of the conference), she speaks out against the spread of orphanages in developing countries, caused by the good intentions of foreign donors, and of harm that comes to children when they are separated from family and left to grow up in institutions. Tara is the Managing Director of the Cambodian Children’s Trust (CCT) which she established with Jedtha Pon in 2007 in order to rescue fourteen children from a corrupt and abusive orphanage. She has led CCT through a number of significant organisational changes, including the closure of the initial CCT orphanage in favour of a family-based care model to empower Cambodian families to escape poverty, assist institutionalised children return to families, and help orphanages transform to a family-based care model. Her first book, ‘How (NOT) to Start an Orphanage – by a woman who did’ was published in April 2016. In Nigeria, 162 children were rescued from a baby factory. Pregnant women sometimes end up in the baby factories after they have been promised health care, but after delivery their babies are simply taken away from them. In other cases, women are raped and conceived. The babies and children are then sold for adoption, used for child labor, smuggled to Europe for prostitution or ritual murder. In 2013, seventeen pregnant teenagers and eleven babies were rescued from a home in the southeastern state of Imo. The girls declared to be raped by one man. Click on the image above to read more. The first reported case of baby factory was published by the United Nations Educational, Scientific and Cultural Organization in 2006. Several more baby factories claiming to be orphanages were revealed over the years by police raids. 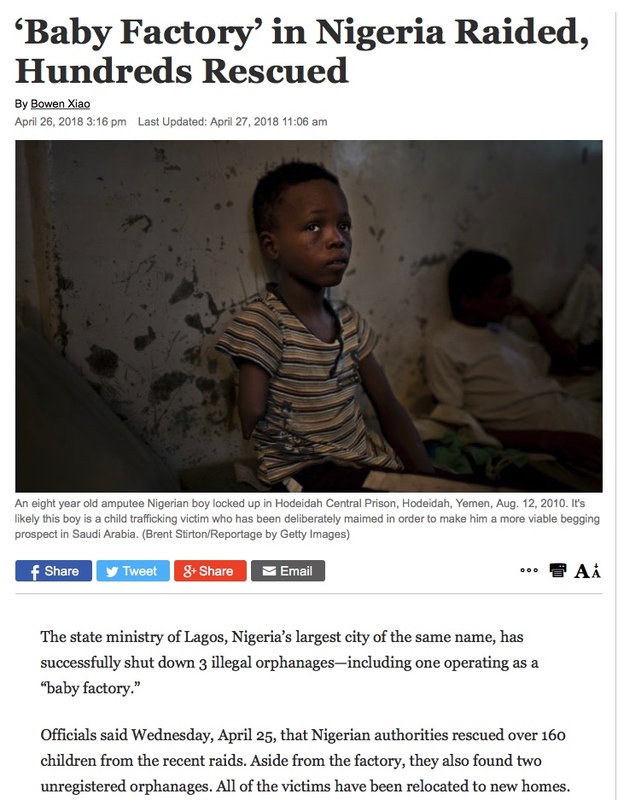 In 2014, the proliferation of baby factories and child trafficking in Nigeria has led Denmark to ban adoptions from Nigeria after raid on baby factory. In 2016, Denmark also banned adoptions from Ethiopia after a series of inspection at adoption facilities in the country. Early this year, Ethiopia banned adoption of children by foreigners. Ethiopian MP said orphans and other vulnerable children should be cared should be care by local system, in order to protect them from abuse abroad. Ethiopia is not the first country that stopped adoptions by foreigners. Country after country has closed due to corruptions, and when a country is closed adoption agencies simply moves to another country where the stories repeat. (Read the article, The Lie We Love and watch the documentary, Search a Child, Pay Cash). Think first before signing their petition. Those who need kids to stay in orphanages the most are the adoption agencies and prospective adopters. 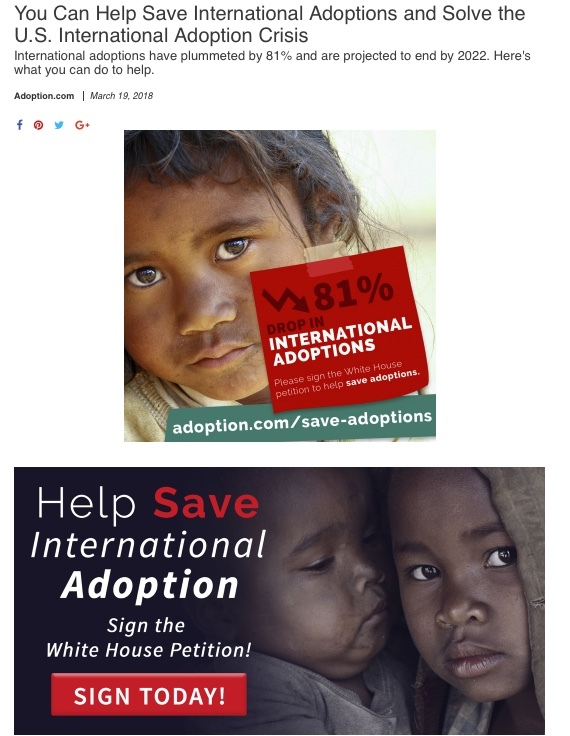 The adoption industry needs the orphan industry to supply the demand. And prospective adopters need the orphan industry to get what they want (babies). The demand of adopters is for healthy babies or young healthy children. International adoption creates more new baby ‘orphans’ and adoptable ‘paper orphans‘. It seldom saves the existing real orphans who are older or disabled than requested by adopters. “Just as the U.S. looks to China and other countries, Canadians look to the United States,” says Jane Turner of Adopt Illinois, a private adoption agency. Adopt Illinois is one of 26 agencies in the U.S. accredited by the State Department to handle adoptions involving an American-born child and foreign parents. Adoption of US-born children by non-US citizens approved in France, Italy, and the Netherlands. 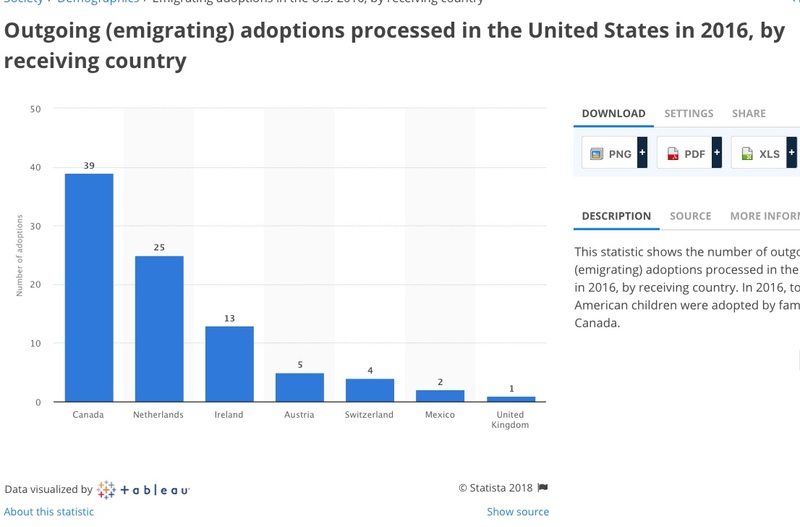 This statistic shows the number of outgoing (emigrating) adoptions processed in the United States in 2016, by receiving country. In 2016, total 89 American children were adopted by families living in Canada or Europe; 39 of them were adopted to Canada. “this is a child you could adopt with much less cost and much less time”, says an ad. Images above from a French documentary, Enfants jetables (Disposable children), about rehoming of children in the USA. watch the youtube video child exchange or click on the image above to read the detailed written report. Hana Williams, adopted from Ethiopia, was murdered by her adoptive parents in 2011. Sherin Mathews, 3 years old adopted from India, was murdered by her adoptive father in 2017. Adopted at 8 from S. Korea into an American family, Phillip Clay was deported 29 years later, in 2012. He ended his life on May 21, 2017 by jumping from the 14th floor of an apartment building. Adopted at 9 months old from Vietnam, Denise discovered she wasn’t as US citizen when she sought her birth certificate to apply to become a Philadelphia police officer in the mid 1990s. “We call on Congress to uphold the promise to adoptees by fixing the legal loophole and passing the Adoptee Citizenship Act of 2018 allowing citizenship for all adoptees of US citizen parents.” Adoptee Rights Campaign. Fix first before demanding to bring in more children!